The Shakespeare Clinic started work in 1987 with just a handful of Shakespeare and claimant poems and plays to test, using three novel Thisted-Efron computer tests. The students on the Clinic came from all of the Claremont Colleges, most of them from Claremont McKenna College. They were funded by the Sloan Foundation's New Liberal Arts Program and reported to the Shakespeare Authorship Roundtable, of Santa Monica, California. Their assignment was to use computers to shorten the list of 58 Claimants to the "True Authorship" of Shakespeare's poems and plays. Preliminary results, broadcast by ABC-TV to 12 million viewers, were inconclusive, but seemed more favorable to the Earl of Oxford, Francis Bacon, and Sir Edward Dyer than to Christopher Marlowe. Pictured above are four members of the 1987-88 Clinic on a hike to a waterfall in nearby Cucamonga Wilderness Area. From left, Greg Cullison, Eddie Thomas, Eric Moody, Fred Vaske. Not pictured: John Otsuki (Harvey Mudd College), Steve Kelley, Jennifer Rau (Scripps College), Frank Hinman, co-advisor Professor Hank Krieger of the Harvey Mudd College math department. The 1988-89 Clinic (above) picked up a new set of students and new advisors, Karen Kossuth (Linguistics, Pomona College) and Rob Valenza (Math, CMC). It restored and added to the text archive and experimented with six tests for poems. Year-end results: Bacon had most mismatches with Shakespeare, Oxford and Marlowe the fewest. 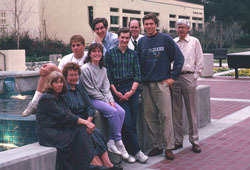 Pictured from left, Susan Suchocki, team leader; Kossuth, Chris Mehnert; Michelle Zager; Peter Morrissey (Pomona College); Buzz Porter (Pomona College); Elliott; Oliver Juergens; observer Pitzer College Linguistics Professor Ronald Macaulay. By 1989-90 the Clinic had developed a 740,000-word commonized Elizabethan poem archive and seven authorship tests, including a powerful, innovative modal analysis test developed by Valenza. For the first time, the Clinic seemed to have validated tests conclusively ruling out all 28 testable poet claimants. Among the casualties were the most popular claimants, Bacon, Marlowe, and the Earl of Oxford. For this feat, the 1989-90 Clinic team got more media coverage than any other clinic: NBC-TV, a half-dozen other networks, and more than 100 newspapers and journals, reaching 50 million people at home and abroad. The celebrity 1989-90 Clinic is pictured above. From left, Dennis Pascual, Sarah Roth, Alaric Fontenot, Kristy Topham (captain), Ann Eagle, Brian Hughes. 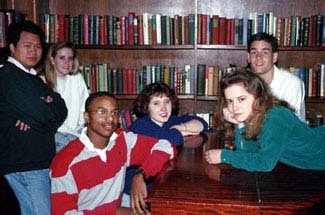 Eagle and Hughes were Rhodes finalists in their home states; Hughes became a Truman Scholar and captain of the Color Guard at Arlington National Cemetery. He is currently enrolled at the University of Virginia Law School.